Visit Bush & Beach Vacations – BosBok Chalets Marloth Park – a Comfortable Self-Catering establishment located in Marloth Park and just 30 minutes from the Kruger National Park, where wild animals roam the savannahs, and the mesmerizing African sunset is your reality. 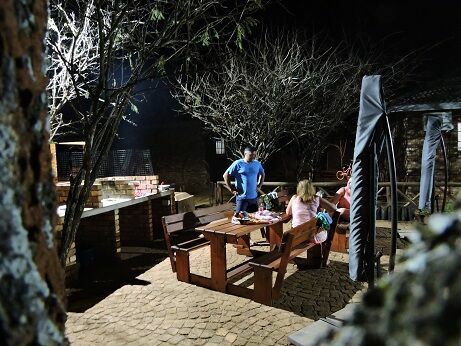 A family retreat to the bush for 4 people for R1500.00 (2 adults and 2 children) at BosBok Chalets Marloth Park Mpumalanga. 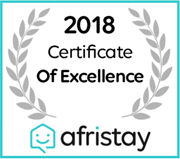 A two night stay for 2 adults and 2 children in a family, self-catering unit. Giraffe, zebra, kudu, warthog, impala, wildebeest and four out of the Big Five reside in the park, which you can see on game drives or horseback safaris. Kruger National Park is a 30-minute drive away. Plan a day trip along the Panorama Route to see the Blyde River Canyon, Chimpanzee Eden, Pilgrim’s Rest and Graskop Gorge Big Swing. In an age where traffic accounts for a good portion of your day, VAT is increasing, and your boss feels it’s acceptable to WhatsApp you work reminders at 11 pm, it’s easy to feel a bit run-down by city life. There’s no shame in feeling like you need a break, and spending some time away from pollution-blanketed city life is scientifically proven to give your mind and body a boost. While South Africans are blessed with the options of mountain retreats, Winelands getaways, and seaside stays, a visit to the bushveld is a unique opportunity you won’t find on any other continent. Kruger National Park is considered the Mecca of safari holidays and has a number of incredible locations right on its doorstep, with one, in particular, offering a unique safari experience. Marloth Park is a popular wildlife sanctuary and holiday town separated from Kruger by a boundary fence and the Crocodile River. The beautiful and serene area offers those who want the traditional bush experience exactly what they want and has plenty of game on offer. It boasts four of the “Big Five” (it doesn’t have elephants) and you can see buffalo, rhino, and lions in its game reserve, Lionspruit. If the lack of elephants is a deal-breaker for you don’t worry, elephants can often be seen splashing about in the Crocodile River that divides Marloth from the Kruger National Park. One of the biggest draws of this unusual location is the freedom of movement it offers to both people and animals, who can roam freely in the 3000-hectare area that isn’t restricted by fences. If you’re stressed about having to run for your life from a lion or rhino don’t worry, only game like kudu, zebra, giraffe, blue wildebeest, nyala, impala, warthog, and ostrich are allowed this freedom. Adventure-junkies can also investigate fun activities in the area like golf, hiking, mountain and quad biking, game drives, and micro-lighting for the extra adventurous. If the incredible wildlife and activities aren’t a drawing card for you and you’re simply looking to relax in a beautiful place that can provide some Instagram friendly photos, this is still an ideal place for you. The quiet atmosphere and slow-pace of this Mpumalanga beauty offer you the quiet break you need from the city with the added convenience of shops, petrol stations, a laundry, bakery, and restaurants nearby, along with the bonus of beautiful African sunsets that no photo can do justice. Even if nature isn’t your thing, the African night sky without the dulling effect of city lights is sure to make even the purest-bred city slicker feel something. Rooms applicable: Self-catering chalet. Please note that Bush & Beach Vacations – BosBok Chalets cannot arrange for any extra beds in the units. Limited to 4 deals per customer. You can buy more vouchers and extend your stay. You may buy unlimited vouchers as gifts, however at a limit of a maximum of 4 per gift recipient.